DEBORAH CROMBIE: Louise Penny and I have been friends since her publisher sent me the galley of her first book, Still Life. I thought it was the best thing I'd read in years, and that she would be a shining star in the literary firmament. (Turns out I was right, wasn't I?) 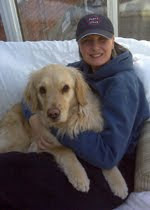 There's nothing Louise and I like better than a chance to have a good old writerly natter. The last time we had a chance to do this in person, we were in London. We met Ann Cleeves at Le Pain Quotidien in Notting Hill, and lunch turned into a long afternoon chat about writing and books. Then Louise and I walked across Hyde Park on a perfect autumn afternoon and sorted out the state of the world. So today, we thought it would be fun to have the sort of conversation we'd have in person, and to invite you to join in. DEBS: First of all, congratulations on Trick of the Light. It's a brilliant book, I think perhaps the best of the series so far, which is saying quite a lot. The reviews, the awards, and the sales have been fabulous. Are you feeling a little overwhelmed by all this? 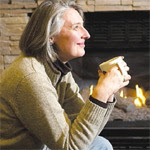 LOUISE PENNY: You are just so kind to say that, my friend. Thank you! Especially coming from you, whom I not only adore but admire as a writer - and aspire to. Thank you. You know, I think a lot of people assume writers are nasty to each other, and some are - but our reality is that your success helps me and my success helps you, and we're just happy for each other. Thrilled, in fact. I know far more writers of crime fiction who are genuinely happy for the success of others, than are not. This is quite a difficult field, so why make it worse by trying to bring others down? I try to stay away from people, other writers or otherwise, who are just nasty. Which is why I so adore you, Debs. you're the anti-nasty. But, back to me, me, me. It's a funny sort of feeling. Wonderful, exhilarating. The dream come true. People are buying the book, coming to events, writing me. But suddenly so much more is being asked of me. More events and interviews. And I'm not sure I have that much more to give. I think it helps that this isn't my first book but my seventh and so the success hasn't been like a tornado, out of nowhere, but a sort of lovely, slower, sunrise. But it's still easy to be dazzled by it, and thrown off a little. It's so hard, don't you find, talking about this without sounding like some spoiled little girl, burdened with success. And it's not a burden, but it is more draining. It's hard to explain this sort of contradiction. I love the success - completely. I love that people are reading the book and come to events, and am genuinely grateful. But I also get run down fairly quickly. Tired. But it's not just the tour. What comes with this are a lot more discussions with the publisher, strategizing for what to do next, interviews. And suddenly the requests for personal appearances skyrocket. And I haven't, in the past, been very good about saying no thank you. I'm getting much, much better. But I feel horrible doing that. When the first couple of books came out I was the one begging for bookstores and libraries to pay attention, to invite me. I don't want to become that writer who's too big to visit a smaller library or bookstore -after all, they were the ones who created my success. Do you find the same thing? If we say yes to everything we have nothing left for writing, or our families and friends. But what to agree to and what not to? How do you handle it? DEBS: I don't think I handle it very well, but I have become better at saying "no" over the years. You're on a punishing book tour schedule at the moment. It's always wonderful to talk about a new book, and to hear reader's reactions. But do you sometimes feel a sense of displacement? Because by the time a book is published, we, as writers, are usually well into, if not finished, with the next book. So we've been living in our imaginations in a new and different story for a good while. Do you have any special way of pulling yourself back into the just-published book, so that it has immediacy for you? LOUISE: Oh, I love talking about this! Before Still Life (my first book) was even bought by a publisher I went to listen to a crime writer talk and he described being interviewed and asked about characters from an earlier book, and he said he sat there, stumped. None of it sounded familiar. The audience of other crime writers roared with laughter and recognition. I sat there, confounded. How could that be? How could you possibly forget characters or events from a book, since I had Still Life practically memorized. themes and phrases and characters. And just getting myself back into that story. What's been sort of fun, and very challenging, on this tour is that I've done a couple One Book, One Community events. This is where an entire city (or in one case, a whole Canadian province) chooses to read a single book - and then the campaign ends with the author visit. One place chose Still Life and the other chose Bury Your Dead. So I've found myself discussing three books - while still trying to disengage from Book 8. No wonder so many writers are nuts. I honestly think that as long as we show up to events clothed and sober, we're doing well. DEBS: I know exactly what you mean. This week's panel at the Henley Literary Festival and the BBC Radio interview will be the first time I've really spoken in public about No Mark Upon Her, which I finished last November! So I'll be reading a galley on the plane to London, trying to drop myself back into the story and the characters and the place. I'm looking forward to it, too. Going back to a book is like meeting old friends, and it also really gets the gears going for the book-in-progress. Do you find that as well? LOUISE: Great way of putting it. Meeting old friends. A year or so ago, when reading from Still Life for the first time in years I actually started crying. I think it was partly the pleasure of meeting those old friends - but also all the memories of that time, when Still Life first came out and I held my first book in my hands - that unimaginable time - all overwhelmed me. The problem I have, though, is when or if people ask why I did something in a book that is three or four or five years old. I can't explain why I chose the clothes I'm wearing - to explain something that I'm sure made literary sense at the time, many years later, is very difficult. I end up sounding kinda moronic. Do you find yourself in that position - explaining something from years ago? DEBS: We've talked here on Jungle Red earlier in the week about writing mementos--I tend to save little physical things that remind me of a particular book. (Right now I'm looking at the painted enamel canal-ware mug I bought when I was writing Water Like a Stone, now holding pens on my desk.) Do you keep any physical touchstones that connect you with your books? LOUISE: I don't. But I love the idea. Most of the things that remind me of writing a particular book I end up eating. Different sorts of pastries accompany me through different books. For the latest book it was these very thin cinnamon and raisin bagels, toasted. With a bowl of cafe au lait. Whenever I smell cinnamon now I'm immediately back in the living room, in front of the fireplace, writing. What I do have, though, is a playlist. I never listen to music while actually writing, but music really inspires my writing. I listen to it a whole lot while driving or walking - it opens something inside me. And each book has a different sound track. On flights I stare out the window and play the different sound tracks. On the ipod I have them all listed. And again, I'm transported. Do you find music plays a part for you? I'm really curious to know if you have any thing you do that allows you to get ever deeper into a character or a theme. DEBS: I'm laughing out loud here. Your books always make me want to eat!!!! I dream of the food at the bistro! And I love the idea of soundtracks. Could you give us just a little hint about what you've listened to for different books? I'm not as good at listening to music as I should be, especially since two of the previous books and the one in progress center on music--opera in Leave the Grave Green, Gregorian Chant in A Finer End, and the main character in the b-in-p is a rock guitarist. I did listen to chant for at least a year while writing A Finer End--and I love the idea of your new book (more on that in a bit.) But at the moment I'm exploring all kinds of music that I'm not very familiar with, and loving it, but I hadn't really thought of making a soundtrack. Hmmm. LOUISE: I'd forgotten you'd also explored Gregorian Chants. How wonderful. I knew we were sisters of the soul. My sound tracks are real mix ups of all sorts of music. Lots of Celtic - some classical, some classic rock like don McLean, some rap - I love Eminem, though I suspect he'd be humiliated to know a middle aged white Canadian woman was listening to him. Alicia Keyes, Ali in the Jungle, Lux Aeterna, Foo fighters. All a bit of a smush up. LOUISE: Oh, I do adore you - what a perfect description of the writing life. Old sweats, stained with bits of food and dribbled coffee or tea, fighting to keep terror at bay and sometimes, sometimes, standing up and feeling that wings have somehow sprouted. Elevated, miraculously, beyond anything I'd planned to write. Yes - that's me. And the real me. The touring me is also a facet, but much smaller. My preference is always to be at home, with Michael. Quietly. Not even answering the phone. A perfect day for me is one without other people. I'd make a great hermit. But not, I think, eventually a happy hermit. Meeting people, and having to go on tour, is probably a blessing. I've been thinking about this and realize what I like and what I don't. I like doing the events. Standing in front of the room and talking with people about the book and the series. I like signing books and chatting with readers. I don't like a different hotel room every night. I don't like crappy hotel rooms. I don't like the travel itself. And while I know people are doing it to be kind and hospitable, and that it's part of the job for me - I honestly don't like the social side - the dinners I'm invited to. I'd rather order room service, conserve my energy, and use what I have for the event. DEBS: One of my guilty pleasures is room service in a nice hotel room when I'm tour. Like you, I love the events and signings, but they're draining, so I tend to be very protective of that little bit of down time. I very seldom even turn on the television or talk on the phone. And I have my little hotel-room-as-sanctuary rituals; the careful unpacking, the book and reading glasses by the bed, sometimes even a little scented travel candle. It's a way to make it seem like the space belongs to me, and it's very centering after a day of throwing everything outward. LOUISE: I'm quite anti-social. Always have been. But, oddly, I actually like people. But it can get overwhelming. I have to say, when I speak, I sure admit the terror and the muddle and my confusion and my crappy first drafts - and all my insecurities. you do too, I know. You're very open with your readers. Were you always? DEBS: I've never forgotten how kind people were to me when I first started writing, and how overcome I was when I met REAL writers for the first time and they were not only nice to me, they seemed just like ordinary people. Which of course we all are, but I think we're also a little split. It's a funny job, isn't it? It requires a capacity--actually a very deep need, I think--for time spent alone. But on the other hand, I like people. I'm very social, I like interacting with readers and other writers. And if I didn't like people I doubt I'd enjoy writing about them as much as I do. And speaking of the next book, I think you're finished, or almost finished, with the new Gamache novel. Can you tell us anything about it? express ourselves, with and without words. DEBS: I LOVE this!!! (You knew I would!) And what a challenge this will be for Jean Guy. I can't wait to read it. And the one that's gestating now. But I suspect if I join the "write faster, writer faster" chorus, you'll hit me over the head with something. DEBS: Louise will be checking in to Jungle Red today to answer questions and respond to comments, although honestly with her tour schedule I'm not sure how she's managing that! But do say "hi" to Louise if you have the chance. It's been such a treat to have her on Jungle Red! Thank you both for being so honest with us. As someone still struggling to get her first book published, I'm in awe of both of your success stories, but also comforted by the thought that I'm not the only one sitting here in here in terror that I will NEVER get the WIP finished or struggling for hours over a sentence. I have loved Louise's books since my (Canadian) sister sent me Still Life. 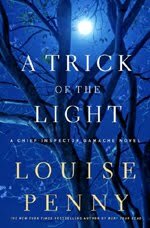 I even won an ARC of Trick of the Light by submitting a very silly marketing plan to Louise's contest, so I got to read this brilliant work early. I promise I won't invite either of you to dinner while you're on tour! 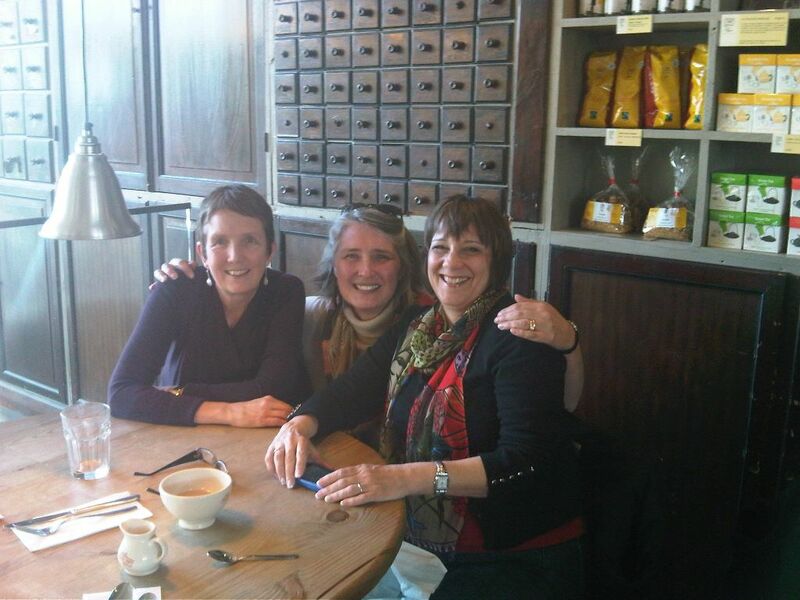 Louise, thanks so much for coming to visit us here at JRW--you and Debs make quite a pair! I had planned to come and hear you at RJ Julia bookstore in Madison, but then the hurricane swept through and I had too much on my plate. We are all big admirers of your books and your success here--and wish you a speedy trip back home! How wonderful it was to hear the back and forth between two of my favourite writers and the glimpse into the behind the scenes writing careers. As the famous British movies go - carry on Deborah and Louise. How very lovely to be able to "listen in" on a conversation between two of my favorite women this morning. As you both know, I'm a huge fan of you both and I thank you both for all the enjoyment your work has brought me. Now, quit chatting you two and get back to work!! What a lovely way to start my day! Thank you, Louise and Deborah, for allowing us to sit in on this remarkable conversation. Louise! I'm so jealous that you and Debs are chatting and I'm left out. Those Bouchercon chats we three did--billed as the Three Goddesses (naturally) were my fondest B'con moments. I wish someone had recorded them because so much real stuff came out. Anyway I'm rejoicing in all your success and so proud to be your friend. And I don't think non writers or beginning writers realize how much terror there is in the process, even after ten or twenty books. I really think I need to write scared to create a good story. You know, Louise is honestly one of the few people I could sit and listen to (or read) all day. I'd almost suggest stopping touring entirely so as to get those books out even faster, but then I'd never have the chance to see her. It sounds like you two had a splendid time, Deb. Thanks for sharing it with us. Thank you both for a wonderful chat! I actually discovered Louise's books and Debs books from a post by Julia Spencer-Fleming (I don't remember where) and that led me to Jungle Reds. I wonder how writer's deal with all the "social media" that is suggested by your publishers or agents. I don't know how you find the time to write. Your readers love it, but it must be difficult. Thanks for the chat! What a complete treat to read this interview today. I'm in the middle of reading the first (and my first) Gamache novel and adoring every delicious page. I'm sorry I didn't discover it years ago but I have the pleasure of looking forward to reading the whole series now. Thank you, Debs and Louise, for taking me inside your writing life. A true delight. Two of my favorite authors. I'm kvelling. Thanks, all, for the nice comments! Louise and I had such fun putting this together. I just wish we would end up in London at the same time and would have a chance to do this in person again soon . . . Thank you! This was very informative (and comforting!) for this newbie! What a fabulous conversation. Thank you for sharing such intimate parts of yourselves with us and for discussing the writing life so honestly. We're supposed to be sober at book events? Damn. Laura, did we say sober? What a wonderful conversation! I love both of work and love knowing you are friends. And yes to to the scented candle I do that and its great. Also so funny about not remembering anything about the old book when its not the one you are currently writing. And lastly - I listen to Gregorian chants while writing all my books now. So I esp can't wait for your new one Lousie!